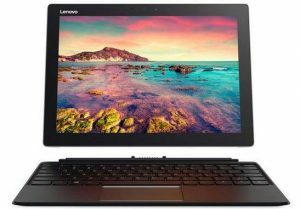 Comparing Microsoft and Lenovo Windows 10 tablets - PC Buyer Beware! Windows 10 tablets that come with a detachable keyboard, such as Microsoft’s Surface Pro models, are really small, ultra-portable laptop PCs capable of running office applications and other heavy-duty software. Not the case with most tablets that use the far more limited Google Android operating system. Microsoft is not the only manufacturer of Windows 10 tablets. Other major manufacturers, such as China’s Lenovo, are competing strongly with Microsoft in that market. Both Microsoft and Lenovo are set to launch new Win10 models in 2017. For Microsoft, it is the Surface Pro 5 and for Lenovo it is the Miix 720. Specifications of the Miix 720 are available ahead of the April 2017 launch date. No specifications are available for the Surface Pro 5, not even a launch date, also expected by insiders to be some time in the spring of 2017. The cost of both tablets should start from around US$1,000.00. If you are going to pay that much for a tablet, a few hundred dollars either way is not going to matter much. What you want is the best tablet for your money. Since the specs of the Surface Pro 5 are not available, the table below compares the basic specs of the Miix 720 to the Surface Pro 4. The most likely basic specs for the Surface Pro 5 are in brackets. Both tablets are available in a range of processors, memory, storage capacities, etc. The higher the specs, the more expensive the model. Below is a link to a decent video review of the Surface Pro 4 and a tour of the Lenovo Miix 720. As shown, the build quality of the Surface Pro 4 is excellent. It is a better tablet than the Surface Pro 3. If that kind of improvement continues, the Surface Pro 5 is going to be enticing enough to make many laptop users switch to buying this kind of tablet. The optional extra docking station is shown in the review. As soon as video reviews are available for the Surface Pro 5 and the Lenovo Miix 720, I’ll update this page with the links. Note that a single USB Type-C (USB-C) port (also known as USB-C) can connect up to 6 peripheral devices via a docking station, USB hub, daisy chaining devices, using adapters, etc. The Lenovo Miix 720 only provides a single USB-C port (no other USB ports). Apple’s iPad tablets also only provide a single USB-C port. Note that Thunderbolt 1 and 2 use the same connector as Mini DisplayPort (MDP). The latest version, Thunderbolt 3, uses only a USB Type-C connector. 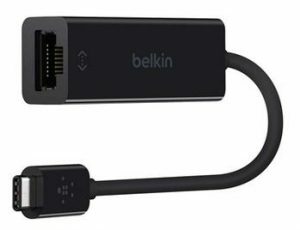 The image below shows a Belkin USB 3.0 hub and a USB-C adapter cable (£80 in January 2017). 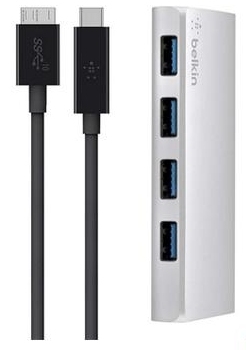 The USB-C end of the cable connects to the tablet and the USB 3.0 end connects to the hub, allowing up to four USB 3.0 devices to connect to the tablet. Depending on its prices, if Microsoft uses the latest Intel Core Kaby Lake processors, DDR4 RAM memory, provides a USB-C port and improves the battery life in the Surface Pro 5 models, they will hold their own or be a preferable purchase to the Lenovo Miix 720 models. January 4, 2017 in Laptop Problems, News, Reviews.